The Falklands, a group of tiny and sparsely populated islands in the South Atlantic Ocean have been the cause of a conflict, which reached across the width of the world for more than a century. First discovered by the West in 1690 by an English ship, the Falkland islands passed between British, French and Spanish hands for over a century. However, the islands lie only about 400 miles from the vast South American country of Argentina, and in 1820 they laid their claim and took the Falklands over. Argentinean sovereignty was not to last long. In 1833, British troops landed on the islands, and expelled Argentina without a shot being fired. This began a dispute between the two countries which still continues 169 years later. In 1892, the Falklands officially became a colony of Britain. The Argentineans regularly protested against Britain’s presence in the islands, which they called the Islas Malvinas, but it would not be until 1982 that the conflict would finally come to crisis. In Argentina, the military junta in power was facing economic and political problems. With hyper-inflation hitting the country badly, and significant public unrest over the people disappearing in government-organised abductions, the dictator hoped to ignite a nationalistic fervour by reclaiming the tiny Falkland territories. Originally planned for the summer of 1982, the date was moved forward as domestic tensions mounted in late March. On April 2, the population of the Falkland Islands woke up to discover that their home had been invaded. The small number of British marines stationed on the island had been overwhelmed by a force of 2,500 Argentinean soldiers and forced to surrender. Over the next ten weeks, the Falkland Islands became the stage for a desperate fight, which would kill almost 1,000 men. Three days after the Argentinean invasion, Britain’s armed forces set sail in the largest fleet since WW2. There was a huge wave of public support for the war, which also brought popular opinion behind the British Prime Minister Margaret Thatcher. The first great clash of the war came at sea. When a strategic plan went wrong, the British fleet found itself trapped between two prongs of an Argentinean attack. If they were to escape, then the weaker target to the South, the Belgrano cruiser, would have to be destroyed. In one of the most daring actions of the war, nuclear submarines attacked the Belgrano outside the 200 mile exclusion zone which the British had declared around the Falklands. This was a major change in the rules of engagement, and the sinking of the Belgrano resulted in 368 Argentinean deaths. However, the British victory effectively ended the threat of the demoralised Argentinean fleet. Despite aerial attacks including, most dangerously, the threat of Exocet missiles, the British made their way to San Carlos Bay and established a beach head there. Their landing site was the opposite end of the island from the capital Port Stanley, where the Argentineans expected an attack, and their landing on the bay was unopposed. However, the choice of San Carlos Bay meant that British troops would have to work their way across the whole length of the island, 65 miles, before they would be able to take the centre of government. When the Argentinean air force successfully destroyed a ship carrying the British transport helicopters, it became obvious that the British would have to walk 65 miles, fighting for ground all the way. It was a difficult fight, with the paratroopers winning one notable, but extremely costly battle at Goose Green and taking 1,300 Argentinean soldiers prisoner. Although air attacks on two landing ships, Sir Galahad and Sir Tristram at Fitzroy decimated the Welsh Guards, the Argentineans did not win a single land battle throughout the course of the British advance. Perhaps the closest battle to be fought was the last. Mount Tumbledown was the last of the mountain defences guarding Port Stanley, and was held by experienced Argentinean troops. Although the British eventually succeed in taking the position, the determined resistance of the Argentineans brought the operation dangerously close to defeat. Soon afterwards, the Argentinean forces in the Falklands surrendered. Although they still outnumbered the British by 2 to 1, fighting in the streets of a largely wooden town, could have caused horrendous casualties for both sides. Nonetheless, when he returned home, the Argentinean military governor General Mario Menendez was held responsible for the defeat and put on trial by the military authorities. Why Did the British Win? On paper, the Argentineans should have won the Falklands War. They outnumbered the British forces by 3 to 1; they controlled the airstrip on the island, and they were only 400 miles from their own coast, whilst Britain lay on the opposite side of the Atlantic. Although Britain was able to send a huge fleet across the ocean, cutbacks had severely depleted the proud British navy. The British only had two aircraft carriers available to them – if one had been lost, then they would have lost the war – and had been so short of transport ships that they had commandeered a luxury cruise-liner, the Canberra to carry thousands of Britain’s most elite troops to the Falklands. The British could send only their 40 Sea Harriers against the Argentinean airforce of more than 100 planes. Nonetheless, against the odds, and despite the undisputed bravery of their soldiers, the Argentineans were defeated. More than any other single reason, this seems to be because the numerically superior Argentinean army was made up of conscripts lacking even basic military instruction, who were facing the most highly trained and disciplined forces of the British army, navy and airforce. The Scots and Welsh guards, the marines and the SBS (to name but a few) were all fighting in the Falklands and their determination and skill undoubtedly played a vital part in British victories at Mount Tumbledown and Goose Green. It was also significant that the Argentinean command failed to organise effective counter-strikes as the British landed on and advanced across the mountainous islands. The war had major consequences for Britain, Argentina, and the Falklands themselves. Although figures vary, almost 1,000 men were killed on both sides (about three times as many Argentineans as British), and many more were seriously wounded. One soldier had been killed for every three members of the tiny rural population in the Falklands. The majority of the Argentineans who died had been conscripts, forced into the fighting by the military government. Although it had only lasted for 10 weeks the war had cost billions of dollars. In Argentina, the dictator-President was deposed soon after the defeat, and the path was laid for a return to democracy, whilst in Britain, Conservative Prime Minister Margaret Thatcher would call an election for the following year and more than treble her parliamentary majority. The antagonism between the two countries has only been worsened by the conflict. Although, perhaps, most British people associate the name of Argentina more with the World Cup than with hatred, terrorism and war, feelings still run extremely high among many Argentinians. 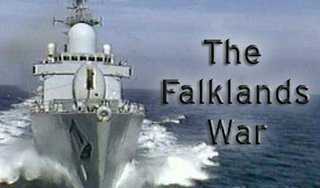 Many also claim that the history of the Falklands War is biased – told only from the British point of view. The Falkland islands have remained under British sovereignty to the present day. The population, who are mostly British speaking and of British origin, have refused any offer to become part of Argentina. Although there was a great deal of damage caused by the war, within five months of the original Argentinian invasion the victorious British troops had left, and the Falklands were once again secure in their position as a British dependency.